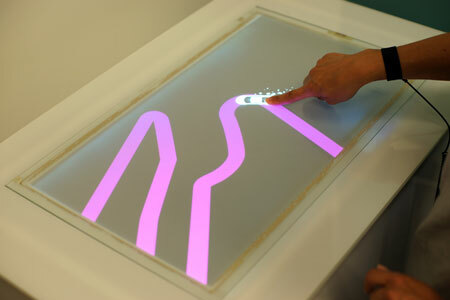 TeslaTouch is a new tactile technology that infuses finger-driven touch interfaces with physical, tactile feedback. It is based on the electrovibration principle, which can programmatically vary the friction between sliding fingers and a touch panel. TeslaTouch uses minimal power, and requires no moving parts, making it inexpensive and lightweight. Unlike most of the existing tactile feedback technologies, which use mechanical devices to provide tactile sensation, such as vibration motors, Teslatouch can provide tactile sensations on touch panels of any size and shape. 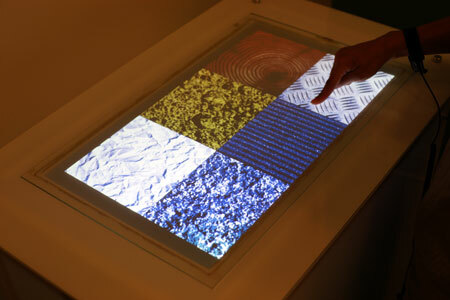 When combined with an interactive graphical display, TeslaTouch enables the design of interfaces that allow the user to feel virtual elements and their properties on a touch screen. When moving a file, for example, the level of friction could convey the file size; feeling textures and materials could be explored with fingers; objects could be felt “snapping” into place; or perhaps with a quick “rub” of an email application’s icon, you could sense how many emails are unread. These are just a few applications of how this technology could be effectively used. TeslaTouch is based on a principle of electrovibration discovered in 50s. The electrode gets excited by an electrical signal of sufficient amplitude that generates an attractive force between the user’s finger and the panel. Changes in friction are periodic and generate the feeling of dynamic tactile textures on a static, unmovable glass surface. 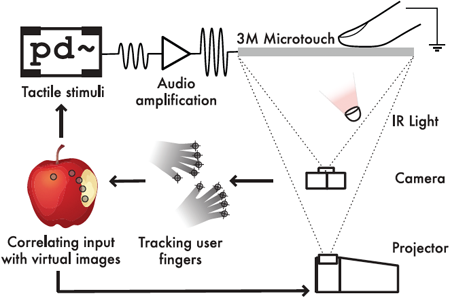 TeslaTouch was developed in 2010 at Disney Research Pittsburgh by Ivan Poupyrev, Olivier Bau and Ali Israr in collaboration with Chris Harrison, HCII CMU. Mark Baskinger and Jason May, CMU School of Design designed and produced TeslaTouch prototype enclosure. Early explorations of TeslaTouch technology were conducted by Ivan Poupyrev while at Sony Computer Science Laboratories in Tokyo. Best Demo Award at World Haptics 2011 Conference.